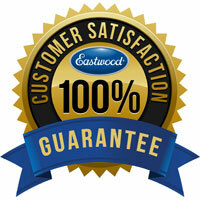 Eastwood Benchtop Blast Cabinet is rated 3.9 out of 5 by 24. Rated 5 out of 5 by Shawn from Great cabinet for small to medium parts I bought this to blast dirt bike parts for a restoration project. Even with a slightly undersized compressor it works well. No it doesn't perform like an industrial size cabinet, but you get what you pay for. Quality wise it surpasses similar units. Rated 5 out of 5 by Mgoblueman from Terrific Product in a compact bench top size. I purchased this product for our small shop because we did not have a Media Blast Cabinet. It is a professional product with a compact footprint! Well designed with sturdy construction. I personally performed the assembly and the instructions were well written and easy to follow. Everything went together w/o any problems. An unexpected bonus was finding a second, completely assembled EOM spare lid with glass and protective tear away sheets affixed to it, included in the shipping box. A very nice surprise! A Very professional addition. Rated 5 out of 5 by Mike from Blast cabinet Assembled unit with no difficulty except the gloves were tricky to get installed. Everything aligned well. What kind of results would be expected if I use an air compressor that has a rating of 4.1 CFM @ 90psi? 10cfm @ 80psi is the minimum air requirement to run this machine. As stated you should use 60 grit or finer in these cabinets; so 60 or a larger number. Walnut shell is 20 grit and too coarse to run in these machines- it will clog them up. Will a17x8 wheel fit inside to blast? Where is this unit produced? US.. China, etc? Does the unit have a bottom plug so the media can be removed,strained and reused. Yes, there is a drain on the bottom of the unit which can be drained by removing the 15mm nut very easily. Total weight of this unit is 49 LBS. This unit cannot handle 200 PSI. You only ever want to run this unit at 90 PSI. 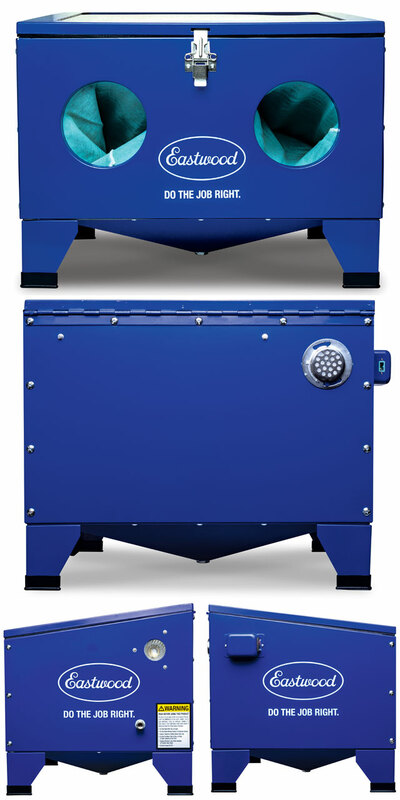 According to your specs, the smallest blasting cabinet needs about 10 CFM to operate but the largest floor model in the same type needs only 7 CFM. Is this correct? The cfm specifications listed on the cabinets are all going to be 7 cfm at minimum. The cfm will change depending on the size nozzle that is being used. 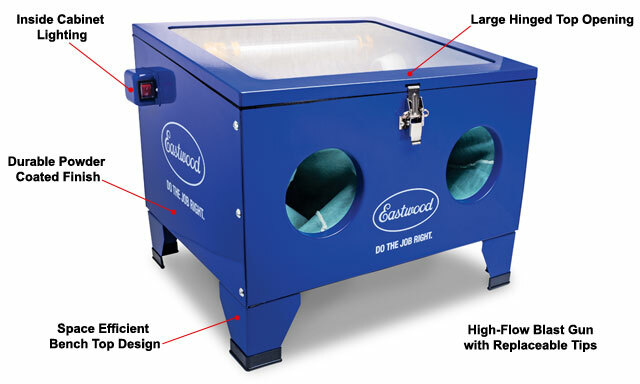 The smart, space efficient design of this bench top media blasting cabinet really can’t be beat. The whole hinged top of the cabinet is both the access door, and the view window. This gives you much greater access to the inside then even some full sized cabinets. Meanwhile, you look down at your work through a big 19 inch x 15 inch screen, with full sized tear off protection (5pk #30770). Dust control is handled by hooking up any shop vacuum to the cabinet, or use it in a well ventilated area with no vacuum. The whole cabinet will take up just a 24 inch x 20 inch space in the corner of your work bench. That means you have nearly 3 cubic feet of work space to blast in. Just about any shop compressor can run it too; it needs just 10 cubic feet per minute at 80 pounds per square inch. The included high quality gun will work with a variety of media, and has replaceable ends for years of usage. 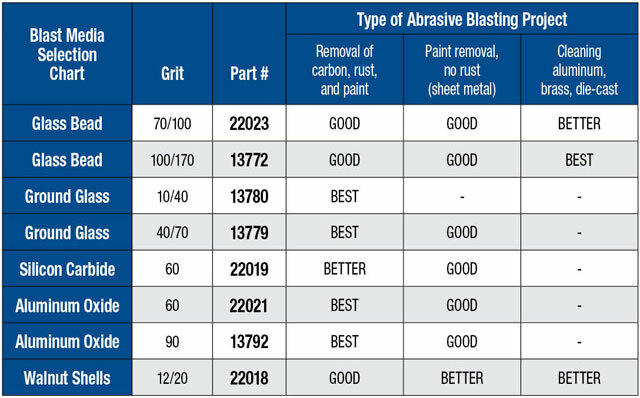 Use with 60 grit or finer blast media. Use of Walnut shell media is not recommended. WARNING! Attaching the wrong wires to the wrong switch lugs will burn out the circuitry in the fluorescent Lamp. The BROWN wire spade connector MUST be attached to the switch lug adjacent to the pre-attached GRAY wire (this is the bottom switch lug). The BLUE wire spade connector MUST be attached to the switch lug adjacent to the pre-attached BLUE wire (this is the upper switch lug).